The SEAT Tarraco is closely related to the Skoda Kodiaq and Volkswagen Tiguan Allspace and sits above the Arona and Ateca in the firm's range. Buyers will be offered two petrol and two diesel engines: made up of the 1.5-litre TSI producing 150PS and paired with a six-speed manual transmission transferring power to the front wheels along with a 190PS 2.0-litre combined with a seven-speed DSG automatic gearbox and four-wheel drive. Both diesel engines have a capacity of 2.0-litres, producing 150PS and 190PS. The lower-powered version can be paired with a six-speed manual gearbox and front-wheel drive, or a seven-speed DSG and four-wheel drive. The 190PS engine is solely available with a DSG gearbox and all-wheel drive. A plug-in hybrid version, with an electric range of around 30 miles, is expected to arrive in 2020. There are just two trim levels: SE and Xcellence. Exact specifications are yet to be confirmed, but the Tarraco will follow SEAT's policy of not offering any optional extras. 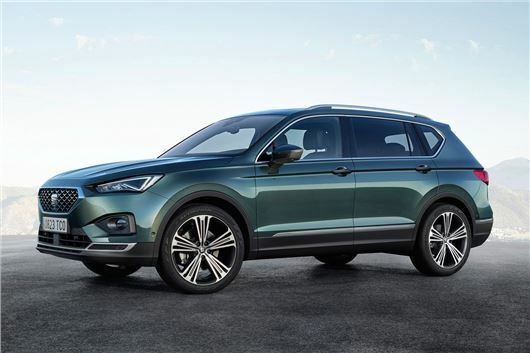 SEAT is the sporty brand of the Volkswagen Group, and the manufacturer says that its new Tarraco will be the sportiest vehicle in the segment thanks to athletic looks and its dynamic chassis control, which can firm up during sportier driving or provide a more comfortable ride when required. As you'd expect, the Tarraco will feature a host of driving assistance features ranging from lane assist to rollover detection. The Tarraco will hint what future SEAT models will look like, with LED lighting and a sporty design. Buyers will be able to choose from eight colours: Dark Camouflage, Oryx White, Reflex Silver, Atlantic Blue, Indium Grey, Titanium Beige, Deep Black and Urano Grey. Inside, all Tarracos will feature seven seats, along with a 10.25-inch digital cockpit and an eight-inch infotainment screen. Said screen will feature, for the first time in a SEAT, gesture control functions. Prices are yet to be confirmed but we'd expect it to be broadly in-line with the Skoda Kodiaq, which currently starts at £28,260. Orders for the SEAT Tarraco will open in December with deliveries starting early in 2019.